ATLANTA (CNS) — People need to talk about the death penalty issue in their families, workplaces and neighborhoods, said Deacon Richard Tolcher, coordinator of the Atlanta Archdiocese’s Prison and Jail Ministry. The summit, hosted in the shadow of the state Capitol at the Shrine of the Immaculate Conception, brought together some 200 people Dec. 10, a day after the state of Georgia executed its fifth death-row inmate of 2015. On Dec. 9, Brian Keith Terrell was put to death at the Georgia Diagnostic and Classification Center in Jackson. He was convicted of killing a close friend of his mother in June 1992. Activists and death penalty opponents at a summit addressed capital punishment’s “indefensible” moral, economic and human toll. 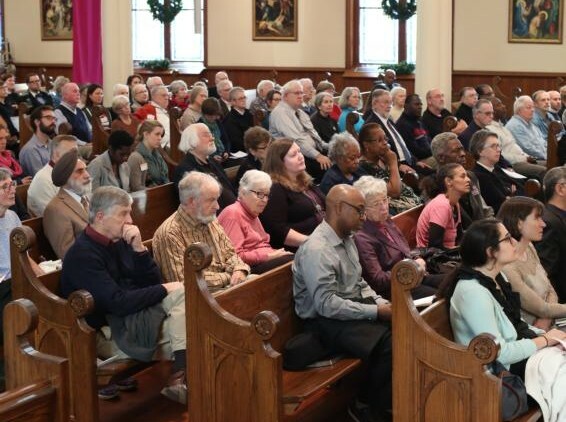 Among the speakers were the daughter of an executed inmate, a former justice of Georgia’s highest court, the spiritual leader of the Episcopal Church of Atlanta, a civil rights icon and others. Justice Norman Fletcher is a former chief justice of the state Supreme Court. Since stepping down, he has renounced the death penalty and called for its abolition. “Mistakes cannot be undone,” said Fletcher, speaking next to a large drawn portrait of Kelly Gissendaner, executed Sept. 30. He participated in a ruling upholding Gissendaner’s death sentence while on the court. He said more than 150 death-row inmates in the United States have been released after evidence proved them innocent. He has “no doubt” innocent people have been executed. Fletcher, who served for more than 15 years on the Georgia Supreme Court, said the death penalty is “morally indefensible,” “makes no business sense” and is not applied consistently. Fletcher retired from the court in 2005. If people aren’t persuaded by calls for abolition because of morality, there are the economic costs, he said. Death penalty cases, Fletcher said, consume 10 percent of the court’s resources but represent less than 1 percent of court filings. That is money that could be redirected to help the community and police, he said. In September, Gissendaner, convicted of orchestrating the murder of her husband, Douglas, went to her death singing “Amazing Grace,” according to reports. At the summit, her daughter, Kayla, recounted her own story, from learning about her father’s murder and growing up with her grandparents, to reconciling with her mother from behind bars. The 1997 murder was committed by Kelly Gissendaner’s then-boyfriend, who testified against her and did not receive the death penalty. Those conversations led to reconciliation between them during the last six years. The criminal justice system needs to also show mercy. A panel discussion with Atlanta Episcopal Bishop Robert C. Wright and representatives from the Southern Center for Human Rights and the Georgia Council on Developmental Disabilities focused on changing state law that sets the bar for executing people with mental disabilities. The PAPE Project — Proof to a Preponderance of the Evidence — is a coalition led by the Georgia Council on Developmental Disabilities, Georgians for Alternatives to the Death Penalty, and Georgia Catholics Against the Death Penalty. The group is advocating during the 2016 legislative session to change the standard of proof to the “preponderance of the evidence” level. Nelson is a staff reporter at The Georgia Bulletin, newspaper of the Archdiocese of Atlanta.